If you are a big fan of listening to music while enjoying a shower, then you’ve probably thought about taking your smartphone to the bathroom. Think about all the accidents that can happen and the money you will spend to replace it. Not a pretty sight, right? The other option would be to grab your traditional radio, but then you won’t be able to listen to your customized playlist and these devices are not waterproof. Shopping for the best Bluetooth shower radio is a smart decision for 21st-century homeowners. 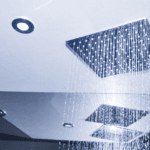 This is a modern addition to your bathroom so you can create the perfect shower experience. These fantastic devices are designed to resist moisture. Unlike traditional speakers and radios, these devices won’t get affected by steam accumulation and accidental splashes. They easily connect to your smart device so you can listen to your favorite hits and podcast channels. In this article, we review 10 of the most remarkable devices on the market and highlight the main points that you should take into consideration while shopping for one. Stay tuned to buy an excellent device. Bluetooth shower speakers and radios are widely common because more people are interested in these state-of-art devices. However, each product on the market has unique features that make it suitable for certain buyers. Here are reviews of the best-selling shower radios. This radio is a unique addition to your bathroom. Listen to your favorite channels while enjoying your relaxing shower with this waterproof device. It features an on and off button that you can effortlessly control in wet conditions for the best experience. Thanks to this exceptional digital shower radio you can store up to 20 radio stations. It features a large easy to read LCD with built-in LED light. The radio operates using 2 batteries that last for long with a reliable power indicator. Moreover, it features a real-time clock with an alarm timer. In extreme weather conditions, it activates a siren function that warns you so you can always stay safe. This device is rather bulky and might not be extremely portable but its robust construction guarantees that it will last for long. Thanks to its JIS7 waterproof marine-grade body, you be able to use it in any dry or wet condition. 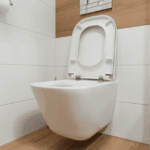 Don’t worry if it accidentally falls into a full bathtub because it is designed to float. Use the built-in Bluetooth and connect it to the smartphone to stream your favorite tracks. Waterproof digital radio to use in wet and dry conditions. Stores up to 20 radio stations. Built-in Bluetooth to pair with smartphones. Real-time clock with an alarm. Enjoy crystal clear stereo audio using this speaker. 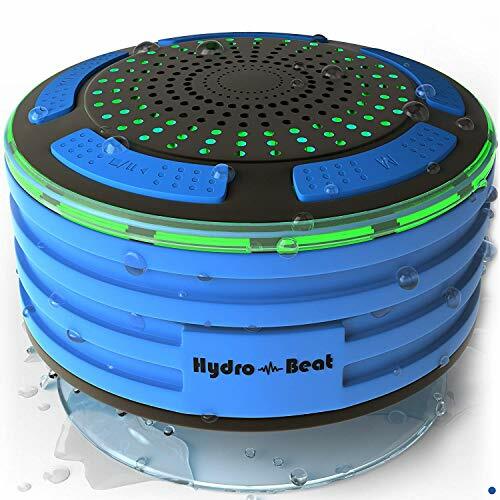 It is the best Bluetooth shower speaker for people who want to listen to their favorite tracks, answer their phone, and relax in the bathtub or shower.It is quite affordable and has a fast recharging battery that lasts for long. 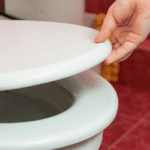 This device features a suction cup to keep it in place, but it might not be that strong. The portable design enables you to take it wherever you like. It is dustproof and shockproof, and it can be perfect for a day at the beach or by the pool. This rugged radio features an IPX5 waterproof rating which means that accidental splashes won’t affect its reception. You can mount it as a built-in microphone or use the hook to hang it wherever you like. This speaker doesn’t have any radio channels, but you can stream them on the phone. It grants you easy access to your favorite hits on Spotify, SoundCloud or any other music streaming platform with 6 hours of playback time. Portable and lightweight design that can be mounted to the wall or hung using the hook. Bluetooth connectivity to listen to music and answer phone calls. Fast recharging battery with 6 hours of playback time. Dustproof design and an IPX 5 waterproof rating. If you are shopping for an affordable low-profile shower speaker, then you need to check this one out. It has fast Bluetooth connectivity so you can easily pair with any smart device when you are indulging in a relaxing shower at the end of the day. The wide range allows you to stream your favorite tracks when your phone is more than 30 feet away. The compact cube design stabilizes this speaker in slippery conditions. It comes with a hanging strap so you can easily hang it on the shower head. Even at high volumes, this amazing device allows you to listen to music for up to 12 hours. Using the USB cable, it will fully recharge it in 3 hours to enjoy a long day at the beach. Don’t worry if water hits your device because it has an IPX5 waterproof ranking to resist low-stream water exposure. It is durable enough to withstand everyday use and accidental drops thanks to its rugged construction. This device can’t support phone calls or doesn’t have a built-in radio. But for the price you pay, you can enjoy long hours of your favorite music. Great Bluetooth range and fast connectivity. 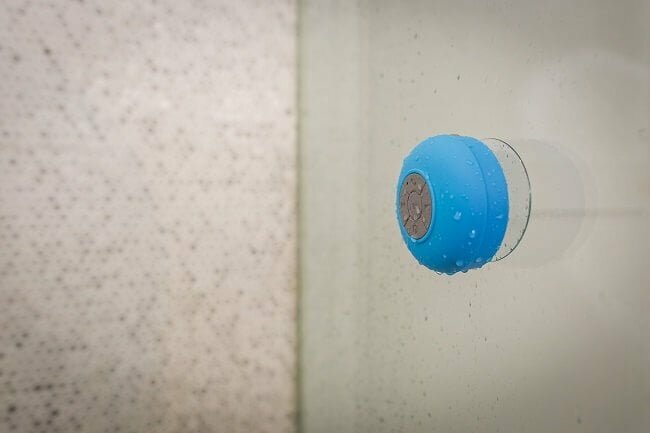 This budget-friendly Bluetooth silicone shower speaker is an excellent value for the money. It comes in 4 different colors and can be easily attached to the wall thanks to its reliable suction cup. It features a wide Bluetooth range for up to 33 feet so you can enjoy listening to music and podcasts without getting your smartphone wet. The smart minimalist design allows for easy control even when your hands are wet. You can skip a track, control the volume and enjoy a unique experience without having to spend hundreds of dollars. The lightweight design guarantees that the suction cup design will keep it in place. The IPX5 provides decent protection from water splashes and steam in the bathroom. Stream a radio station or listen to your favorite tracks. It charges fast, but don’t expect the battery to last for long. Smart design for easy control in wet conditions. This standing speaker is going to look good anywhere you place it. The IPX7 rating means that it is the best waterproof Bluetooth speaker. It can be submerged in water for 30 minutes and up to 1 meter and still function as expected. This shockproof portable design is suitable for people who like to take long baths or enjoy their favorite jams in the pool or on the beach. This device is more expensive than other products on the market, but it provides an exceptional experience to people who want to enjoy their time to the maximum. It features a wide Bluetooth range for up to 100 feet so you can easily pair it with any smart device for the best experience. With a 15-hour battery life once fully charged, you can enjoy your favorite music for as much as you want to. Enjoy loud blasts in 360 degrees. It is compatible with a smart app that allows you to control and connect it with up to 50 Ultimate Ears Speakers. It has a new feature that allows you to use it to activate Siri and Alexa without interrupting your relaxing bath or pool time. It doesn’t have a suction cup or a holder so you will have to figure out a way to keep it stable. Once you do, you are in for some serious jamming with incredible bass quality. Shockproof rugged speaker for outdoor and indoor use. IPX7 waterproof feature so it can be submerged in water without affecting the sound quality. Wide Bluetooth range to connect with all the smart devices in your household. Transform your bathroom or shower room into a mini-concert using this incredible device. 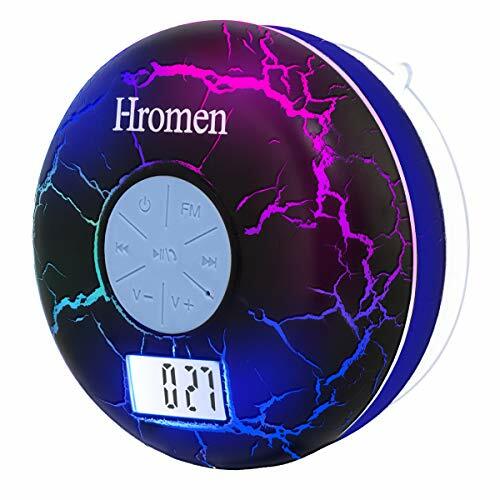 It is an exceptional shower radio clock-in one portable product that looks great on the outside and provides an excellent value for the money. 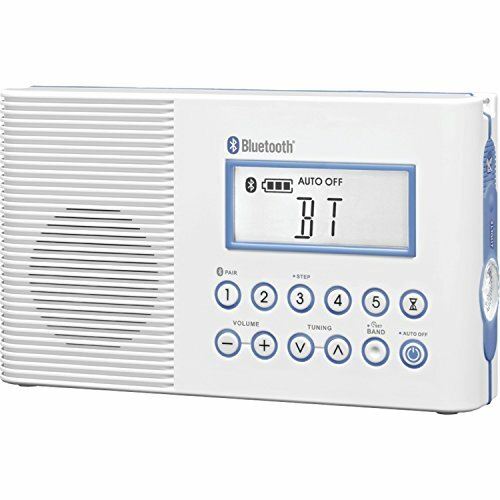 The backlit LCD allows you to tell the time, pick a radio station, and control the volume. The audio output is incredible given the size of this device. It is compatible with almost every smart device on the market so you can stream your favorite music or listen to a motivational podcast. You can save up to 30 radio stations so you won’t miss your favorite radio show for the world. Pick a convenient clock mode that displays time for 20 days if you don’t shut it off. However, time won’t be displayed if you are using the radio feature or listening to music. This radio features an IPX7 waterproof rating so it will not malfunction even if it accidentally falls into the water. 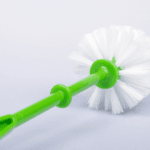 It is lightweight, and the suction cup will hold it in place so you can easily stick it on any smooth surface. The lights are strobe which might be a little disturbing if you are trying to close your eyes while enjoying a long warm bath. Lightweight, portable radio, clock, and Bluetooth speaker in one device. Backlit LCD to show all the details. Saves up to 30 radio stations. IPX7 waterproof rating to use it in various wet conditions. Suction cup keeps it in place. 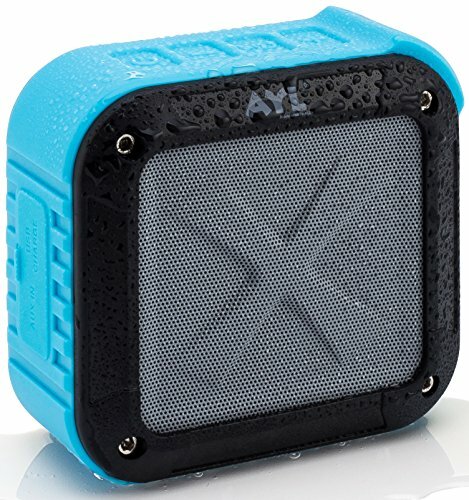 If you are looking for a compact and affordable waterproof speaker, then this is the one to buy. This is the perfect gift for someone who would like to enjoy their time in the shower room or bathtub. 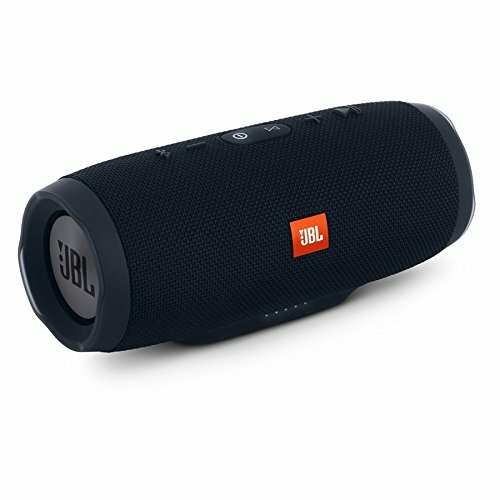 It offers 3D stereo sound quality so you can enjoy the best music experience. This device features high IPX7 waterproof rating so it can be submerged underwater and still provide excellent sound quality. It allows easy access to your phone menu options to play music, answer phone calls, or stream your favorite radio stations. The Bluetooth range of 33 feet doesn’t restrict your options. Protect your smartphone by placing it outside the bathroom or away from the pool and have easy access to all its features. The buttons are easy to control even when your fingers are wet. It features a built-in microphone so you can make phone calls while relaxing in the bath or activate smart devices in the household. The suction cup secures the device to any smooth surface like glass or ceramic tiles, but the device is a bit heavy. This means that it might not hold it up for long. 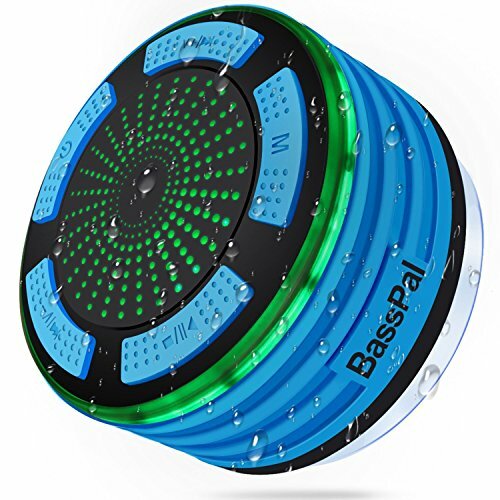 Nevertheless, with its high waterproof rating, you can safely place it on a wet shower shelf to enjoy your favorite songs. Compact and affordable high-quality speaker. Impressive 3D stereo sound quality. Built-in mic to activate smart devices or make phone calls. High waterproof rating for use in extremely wet conditions. This budget-friendly device is compact, lightweight, and portable. It is one of the best shower radios thanks to its IPX7 waterproof rating. It can be submerged in water up to 3 feet for 30 minutes while working with no problems whatsoever. This unique device features a suction cup that secures it in place. Moreover, it can float on top of the pool or bathtub if you are in the mood for extra pampering. The 5W speakers deliver loud crystal clear audio with deep bass whether you are listening to your favorite radio show or most favorite track. This portable radio is dust and shockproof so you can use it on the beach or anywhere you want to enjoy your music. It connects to any smart device thanks to the Bluetooth feature and has a built-in mic for hands-free calling. It features LED light that adds aesthetic value and the battery delivers 8 hours of playback time. However, you will have to readjust the volume every time you turn it off. Compact, lightweight device that you can take anywhere you like. IPX7 waterproof rating so you can use it in the tub, shower or pool. Suction cup keeps it in place, or it can float on top of the water. This device is suitable for avid music fans as it provides exceptional stereo sound quality. It is well-built with effective controls that allow you to customize your music experience while relaxing under the water. The elegant modern design and the convenient controls make it one of the most sought after products on the market despite its high price. 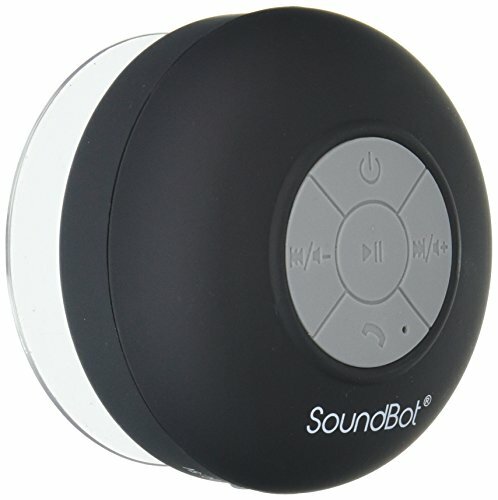 The speaker connects with up to 3 smart devices at the same time so you can listen to songs, receive calls, and activate voice commands. It doesn’t support radio reception, but you can download an FM radio app to your smartphone, and you’ll have the best Bluetooth shower radio at your disposal. 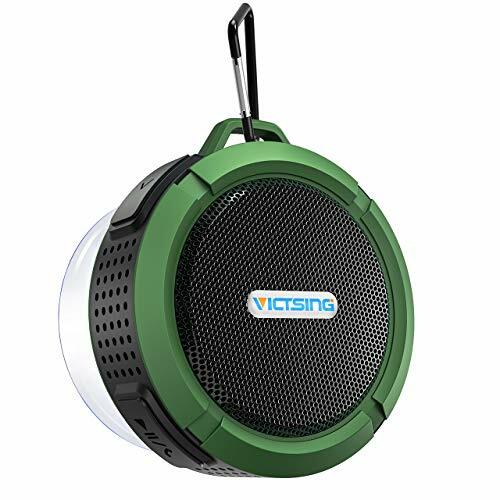 This sturdy speaker has an IPX7 waterproof rating so you can enjoy music near or underwater if you wish. At the same time, it cancels annoying noise and echoes for crystal clear phone calls wherever you are. The battery charges fast and provides up to 20 hours of playback time. This speaker doesn’t have a suction cup or handle to secure it in place, but you can place it on the floor or shower shelf. You can also pair it with speakers to amplify your listening experience. It comes in various colors to suit different tastes. Elegant model that connects with up to 3 smart devices. Connects with up to 3 smartphones using the Bluetooth connectivity feature. 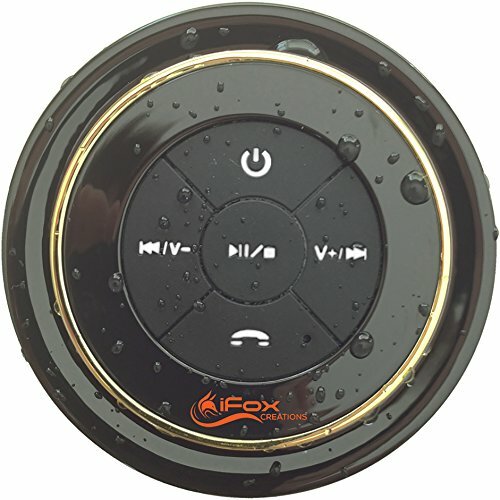 IPX7 waterproof rating to enjoy your music in wet conditions. The last product on our list can be submerged in water for up to 30 minutes and still deliver excellent sound quality thanks to its IPX7 waterproof rating. Moreover, it is dust and shockproof so you can pack it for a day on the beach or a camping trip. This high-quality device is perfect for streaming your favorite tracks and podcasts indoors and outdoors. This versatile device features a convenient Bluetooth connectivity for up to 24 feet. While this might not be the highest on the market, it still allows you to listen to your favorite tracks wherever you are. It features various LED mood lights so you can pick one that adds aesthetic value as it streams music. It delivers a built-in mic so you can take calls while enjoying your shower. It charges fully in 3 batteries time to offer 6 hours of playback time which means that you have to recharge it more often than most products on the market. It comes with a suction cup that you remove if you want the speaker to float on top of the water. Compact device with IPX7 waterproof rating. Built-in mic to make calls without having to touch your phone. Removable suction cup for added versatility. Rugged dust and shockproof design. How to Choose the Best Bluetooth Shower Radio? You probably take a shower once or twice per day. The time that you spend in the shower doesn’t have to be quiet and boring. Moreover, if you are planning to chill in the tub for a warm, relaxing bath, you want to install a practical device that can make your time more enjoyable. When you browse various shower radio reviews, you will find that they provide different grades of sound quality. Some of them might not be strong enough to help you enjoy your music in a noisy shower room. Make sure that the volume controls allow you to enjoy your experience to the maximum. Some models can also deliver decent sound quality even when they are under the level of water. This is a great feature to look out for when you are chilling while taking a shower or a bath. It allows you to stream music from any smart device without jeopardizing it by getting it wet. A wide Bluetooth range is an important thing to look out for. It doesn’t limit your options and can even pair your speaker to activate various smart features that you have installed in your home. There is a big difference between being waterproof and water-resistant. The most important feature of a shower radio is how well it will function when it gets wet. Water-resistant radios or speakers usually have an IPX rating of 4, 5, or 6. These devices can endure accidental splashes in the shower or bathroom and would still deliver excellent sound quality. A waterproof radio or speaker features an IPX 7 waterproof protection which means that the device can be submerged in water. These models will work even when they are 1 meter below the surface of the water. It is a good idea to pick a model that you can easily hang or secure to enjoy your favorite tracks. If the device comes with a suction cup, then it should be light enough to stay in place. Some devices also feature a hook or handle to hang your radio in the showerhead. If the device lacks both, then you can place it on a shelf or the floor which might limit your options. This feature is not found in every shower radio. However, combined with the Bluetooth feature they allow you to take calls, make calls, and control voice orders without interrupting your shower or bath. Rechargeable batteries provide safe operation while using a shower radio in wet conditions. You want to choose a model that recharges fast and offer a convenient playback time, so it is always ready for use. This is exceptionally useful when you are planning to take your radio to enjoy a day on the beach or by the pool. 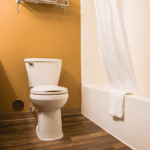 There are a lot of available options if you want to enjoy music in the shower or bathtub. Thanks to the best Bluetooth shower radio you won’t miss a radio show or podcast. These models easily connect with smart devices and can even pair with smart assistants offered by Apple and Google. Think carefully about what you need and you will find a decent product that caters to your needs.